In November of 1975, Australia faced one of the most uncertain periods in its political history. The Prime Minister, Gough Whitlam, was unexpectedly dismissed (which is to say fired) by a man named John Kerr, the Governor-General of Australia. Rumors have swirled for years about whether the CIA or British intelligence services had anything to do with it. And while a new document obtained by Gizmodo doesn’t answer that question, it does add a bit of color to the mystery. The CIA keeps biographic files on world leaders that the agency periodically updates. So back in April, I filed a Freedom of Information Act request for the CIA’s biographic report on Whitlam written two years before his dismissal. Today I received that one-page report in the mail. For the most part the report, dated October 19, 1973, is straightforward and factual with an emphasis on how his actions might affect the CIA. It talks about Whitlam’s friendly relations with the US and his goal for more Australian independence in the South Pacific region. Curiously, Australian troops had just exited the Vietnam War completely in July 1973 as one of the few Western allies of the United States in that conflict, but the report doesn’t even mention this. The conspiracy theories around the CIA’s involvement in Whitlam’s ouster have to do with his opposition to US military and intelligence gathering operations in Australia. Pine Gap in Alice Springs, Australia is perhaps the most infamous NSA installation in the country, installed to spy on practically all of Asia. Whitlam had threatened to shut down the facility if the Australian government wasn’t told more about what was going on there. While it has never been firmly established that the Americans nor the British were directly involved in the ousting of Prime Minister Whitlam, it has come out that the Queen at least knew it was going to happen beforehand. Whitlam’s legacy and the reasons for his ouster are still the topic of heated debate in Australian historian and political circles. What else did the CIA describe Whitlam as other than pragmatic? You could play CIA Mad Libs all day long with this one. “Pinko statesman?” “Nosy pantsman?” “Secret vampire jellyfish?” I have no idea. I’m not saying that Gough Whitlam was a secret vampire jellyfish. I’m just saying that without the CIA releasing the unredacted portion of his biographic report, we can’t know for sure. Leader of the Australian Labor Party since 1967, Gough (rhymes with cough) Whitlam, 57, became Prime Minister and Foreign Minister in December 1972. He intends to turn over the latter position by early 1974 to his friend and confidant, Donald Wille see, who, as his foreign affairs assistant, has frequently acted on Whitlam’s behalf. 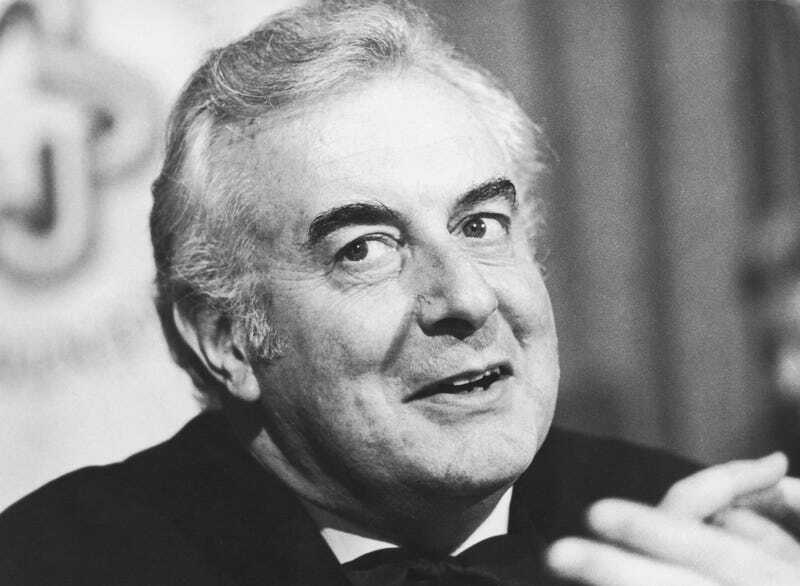 The pragmatic [redacted] Whitlam exudes self-confidence in governing Australia. He has amply demonstrated his ability to quickly implement his “independent Australia” policies. Severing relations with Taipei, his government has opened Embassies in Peking, Hanoi and East Berlin, reduced its military commitments abroad, and strengthened its ties with Japan and Indonesia in a move toward peace and prosperity. Whitlam advocates a strong free enterprise economy, the elimination of social inequality and an open-door immigration policy. He supports the ANZUS alliance but is interested in establishing a regional organization to promote political, social and economic advancement. Friendly toward the United States, Whitlam met with President Nixon and other senior US officials in Washington before attending the Commonwealth Prime Minister’s Meeting in Ottawa in July 1973. Married, Whitlam has four children.